Boys, bullies, and blogs come together in a book that brings the popular online diary format to print. For fans of Lauren Myracle’s ttyl, ttfn, and l8r, g8r, this fun, fast-paced book introduces an unforgettable and relatable heroine and features chapter openers designed to look like the pages of an online blog. An innovative debut, Something to Blog About is filled with the memorable missteps and heartfelt emotions of growing up. Libby Fawcett decides to start a secret blog so that she can have an outlet to vent her feelings and frustrations. 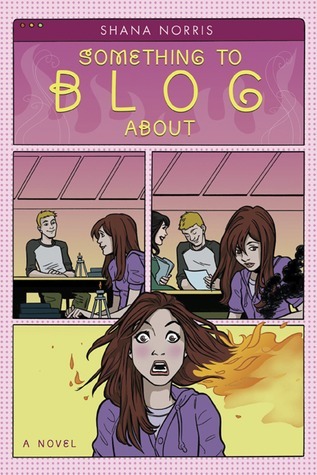 When Seth Jacobs (her crush since eighth grade) witnesses her tragic (and comic) run-in with a Bunsen burner in chemistry class, or when she finds out that her mother is dating the father of her arch-nemesis, Angel Rodriguez, she’s able to keep a level head and make it through school each day with each blog posting. But when her entries get posted all over for the whole world to see, will Libby be able to walk the halls—or face Seth—ever again?